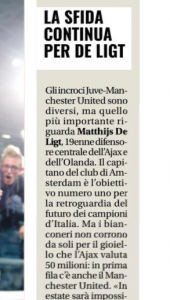 Turin newspaper Tuttosport report Manchester United are now in a battle with Juventus to sign Matthijs de Ligt from Ajax. 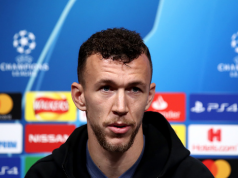 The central defender has been the subject of endless transfer rumours, with Barcelona also repeatedly linked with a swoop over the next couple of transfer windows. Now the Premier League club have joined the challenge to beat others to the signing and Tuttosport places them ‘in the front row’, which shows they accept Manchester United would be tough competition for Juve to face. It’s claimed the Serie A champions see De Ligt as their number one objective to build their central defence for the future. They don’t have any problems in that department right now but want to make sure they continue to be very strong at the back. Andrea Barzagli is close to retirement at 37 years of age, Giorgio Chiellini is 34, Leonardo Bonucci and Medhi Benatia, himself linked with United, are 31. Daniele Rugani, 24 years of age, has been held onto, despite summer Chelsea interest, because Juve are aware they’re ageing a lot in the department. There’s no age worries at Manchester United, and it’s been thought they need experience if they are to add in defence, but 19 year old De Ligt is considered an exceptional talent and could change the thinking. 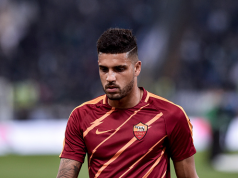 Tuttosport believe Ajax value their player at €50m, which may be on the low side.